Port Almond is Norwegian singer-songwriter Rune Simonsen - also known as the lead singer of Washington (Mount Washington) and Lagoonbird. 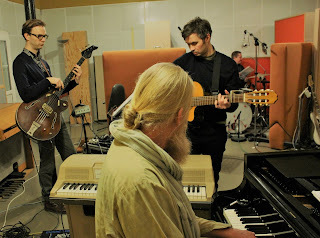 This new self-titled album was recorded completely analogue during a 3-day session in February 2018. It was produced by Guy Sternberg at LowSwing Studio in Berlin. Recorded live with minimum overdubs the album is completely computer-free. 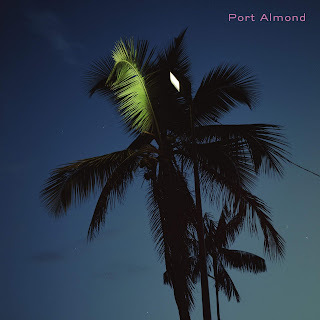 It features Port Almond's unique songwriting style: an extraordinary mixture of soft guitar picking and whispering vocal backed up by a raging, free improvising 7 piece band. Everything is recorded directly to analogue tape using LowSwing's unique collection of vintage equipment from the 60's and 70's. LowSwing Records is a record label dedicated to the love of music on the analogue format, cutting their tape masters directly to vinyl. The artwork was created by Israeli renominated artist Nir Evron. The cover photo was taken at Devil's Island, the infamous French prison in French Guiana. The first track ‘Proxy Boy’ begins with reversed loops and the sound of various instruments playing in a kind of chaotic manner that feels like you’re going back in time. As the vocal and acoustic guitar fade in and you’re taken to a timeless space that is like a nostalgic memory. The second track ‘Destinations’ is really a song to be enjoyed in the sun, and if it isn’t it will surely bring it out. Here you can really hear that analogue saturation of tape, particularly on the kick and snare which actually make it punch in a way that makes you nod your head. Clean, chorused electric guitars and the occasional Hawaiian swells take your mind to a beach destination. This record wasn’t made by a studio that just prides itself on analogue recording, they really know how to do it well and do it creatively. Even down to the amp noise that tremolos at the start of ‘Sea Of Mine’ and the soundscape of birdsong at the end. On the flip side expect soundscapes of waves crashing on the beach, electric pianos and even muted trumpets. This is an album that will make you want to visit Port Almond. "Port Almond" is available exclusively on pure analogue 180g vinyl and is out now!